Mud tubes on exterior walls: Subterranean termites build mud tubes on surfaces, such as a home’s foundation, to provide moisture while they are searching for food. Store mulch, firewood and wood chips away from the home to avoid creating moisture-rich habitats for termites to survive and thrive. Termites pose a serious threat to your biggest investment: your McKinney home. If you suspect termite activity, call a licensed pest management company to do an inspection. A termite specialist can recommend a customized treatment and prevention plan that may involve liquid repellants, wood treatments, baits and, if necessary, fumigation of the entire structure. 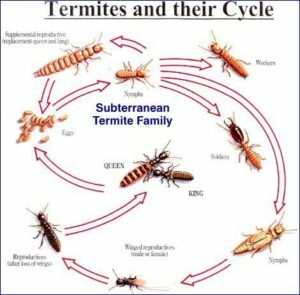 Two main species of termites affect McKinney homes: termites that live underground (subterranean termites) and those that live entirely in wood (drywood termites). Subterranean termites build colonies in the soil, whereas drywood termites can be found in the framing, furniture and hardwood flooring of homes. You can read More about termites on our termite inspection page. A recent termite treatment may not prevent swarming, because the swarms may have already been above the treatment zone in the soil when the application was performed. Don’t panic! Remember, a sudden barrage of these winged termites does not mean your house will fall into splinters tomorrow. Make sure the insect is actually a termite swarmer. Many species of ants will swarm in the springtime, as well, and, because treatment methods differ between ants and termites, it is important to know the difference. A termite swarmer has a beaded antenna, a broad waistline and two pairs of similar wings that they shed after flight. Ants have an elbowed antennae, pinched waistline, two pairs of dissimilar wings and do not shed wings after flight. Figure out if the swarmers are emerging inside the house or from outside. If it is within your house, close off the room in which the termites are swarming, use a vacuum cleaner to remove swarmers after they have swarmed and note the exact locations where the swarmers are emerging. If your house has had a history of termites, find out what company treated it and if you are entitled to any warranty provisions. 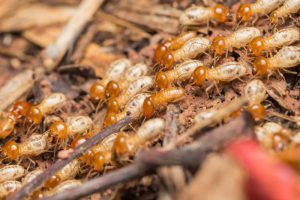 If you have never had any evidence of a termite infestation, this is usually the first signal a homeowner sees that an active infestation exists. Most people miss the insects’ flight, because the swarmers emerge so fast and disperse so quickly. Often, the only result people notice is broken wing parts near windows and doors. Inspect your home frequently for signs of termite infestation, such as swarmers (termites with wings), mud tubes and damaged wood. If you notice any evidence of termites, have your home inspected by a licensed pest control operator. Get more than one opinion and treatment quotation. Avoid cypress mulch in landscape beds. Wood-to-ground contact in any type of structure is an invitation for subterranean termite infestation. Porches and additions may seem insignificant, but the junction point of porches and additions is a major point of infestation in many of the homes inspected. When treating these areas, the pest control operator should take extra care to make sure that the termiticide is applied to form a continuous barrier. Termites cannot eat through solid concrete, but the construction of your “monolithic slab” home is not impervious. Termites can enter through cracks in the slab, openings for bathroom traps; where wooden fences join your home, between the original structure and added rooms, decks or patios, or where bushes and trees in your landscape make contact with the house. Traditional termite treatments require the application of a continuous chemical barrier to the soil around all possible entry points. Raised houses can be some of the easiest to protect against Formosan subterranean termites, since to infest a raised structure the termites must travel up or through the piers or any other objects connecting the building with the ground. Because the underside of the structure is completely accessible for inspection, termite infestations can be detected before serious damage has occurred. Brick and mortar piers are some of the most difficult to inspect and treat, because termites can travel through the center of the pier as easily as they can travel up the exterior. Proper treatment requires that the soil around each pier be treated by trenching or drilling and that each pier be drilled and chemicals applied to the holes. Subterranean termites can use sewage lines, electric conduits and other lines connecting the house to the ground. The area around these should be inspected and treated. Bricks, broken bottles, trash, boards with nails, hypodermic needles and other debris present problems. While such debris under a house may not actually lead to termite infestation, it can hinder an inspector from treating and inspecting properly.